Welcome to gwbikeman.net, I'm Greg Wheeler, and this site is just for fun, and it's all about what I love to do... ride, ride, and ride some more. There's nothing like sitting down on my bike, oozing in, aiming the front wheel, and just cranking those pedals around. Here you can find out about the bikes my wife and I love to ride, and see photos and videos of the bikes and some of our favorite routes. Our base of operations is Harbor Springs, located in the Northwestern part of Michigan's lower peninsula. I am also including some photos of the scenery we enjoy along our favorite rides. We live in a really beautiful area, at least once that pesky snow is gone. Why the red, white, and blue? 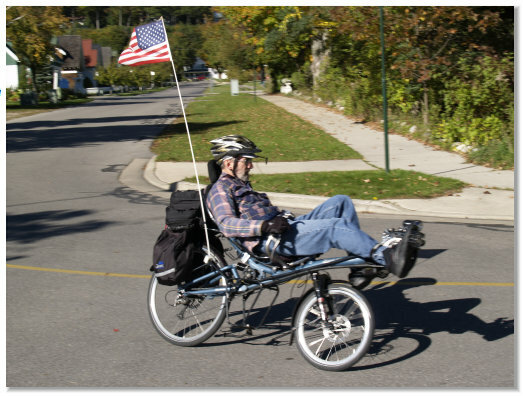 Well, back when I got my first 'bent (recumbent bike), a couple of car drivers told me that I was hard to see, because I sat lower than a "normal" bike. So, I figured I better fly a flag on the bike for visibility. I bought one of those orange triangle ones, but later decided I wanted something with some class. 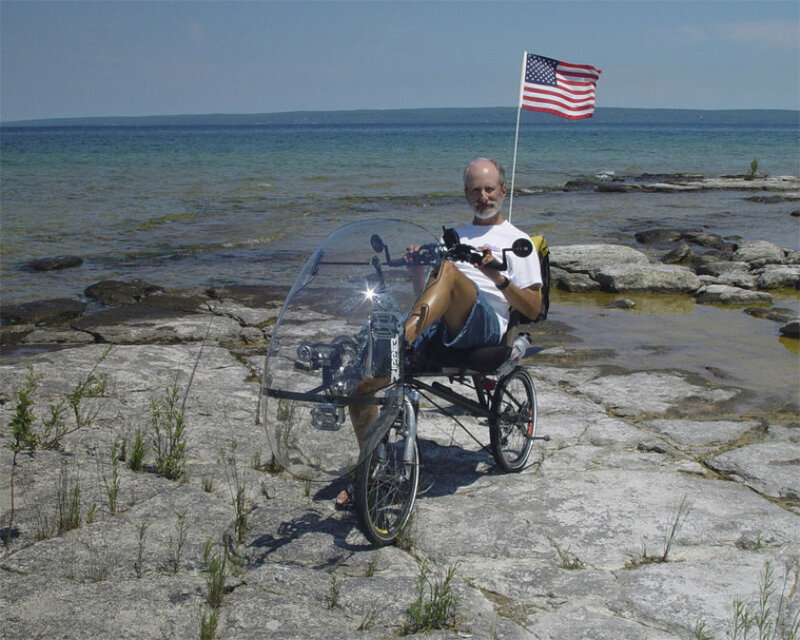 I started flying the American Flag on my bike during the summer of 1999, Since then, the odd type of bike, and the flag practically became my "trademark". Do I rate the privilage of flying the American Flag on my bike? You may wonder why I ride this odd looking type of bike. Think 100% pure comfort! So far, I have ridden this type of bike up to 134 miles in a day, and still arrive home smiling! No more "modified posts" for me, ever. I rode motorcycles for over 30 years, and after buying my Rans, I sold the most recent motorcycle - a full dress Gold Wing. I just don't like the seat or riding position of a motorcycle anymore. This type of bicycle has completely ruined my desire for anything else with two wheels. One of my motorcycle riding friends said he'd give me 7 years, and I'd be back on a motorcycle. Well, as of Apr. 5, 2019, I have pedaled 82,317 miles, and still no motorcycle in my garage. Oh, did I mention that I have this little problem with excess energy? I also considerate myself very fortunate to have a wife that also loves riding, we have enjoyed many thousands of fun miles riding together. She rides a Burley Django bike. 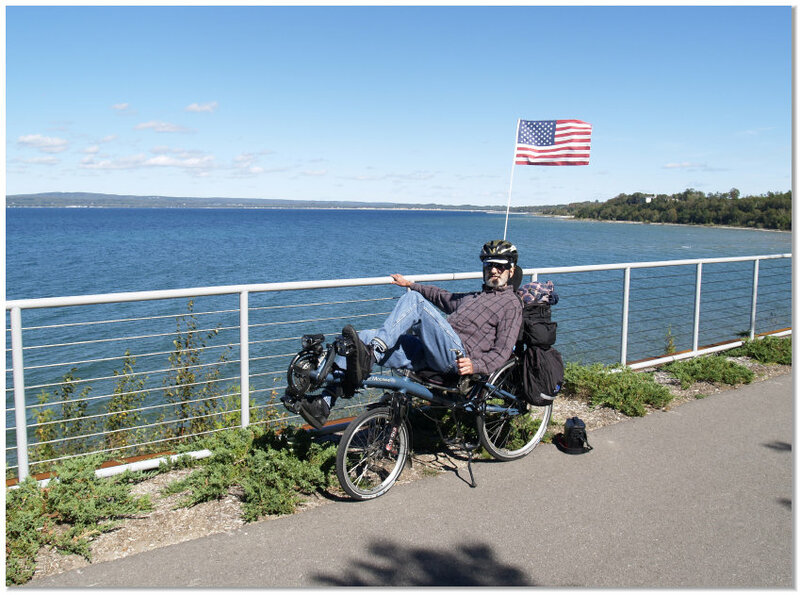 She has pedaled over 32,355 miles on her Burley, plus she helped pedal our EZ Tandem recumbent bike 2,280 miles; and that was after riding about 2000 miles on her Bike E! She has now pedaled 36,635 miles. That's equal to 1.47 times around the world!. By the way, NONE of our bikes have an electric motor assist to help us either! WE are the motors on our bikes!